July 20, 2006 front page by Joan Crothers. Micajah Clark Dyer was finally getting the due he deserved as relatives and friends gathered at the Choestoe Baptist Church on Saturday, July 15. The beautiful Fellowship Hall was filled to capacity with an estimated 300 people, most of them related to some part of the Dyer family. Clark Dyer, as the family refers to him, is credited with creating and setting to flight a "flying machine" off of Rattlesnake Mountain in Choestoe, Union County, sometime in the 1870s. His patent has also been found and one person, Johnny Wimpy, now deceased, was 8 years old when "he saw it fly." He had also also helped Dyer build a large rock wall that is still standing. Dyer is also credited with creating a system of logs to pipe running water to his house from a spring. Neighbors saw him work on other inventions, but most ridiculed him for wasting his time on a flying machine, so he kept it quite secret. 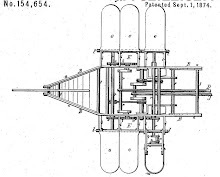 However, when he did get a patent for his invention in 1874, he put an article in the St. Louis Globe of July 1875 and the Gainesville Eagle, some now thinking he was trying to get funds to build his flying machine. After he died in 1891 at 69, his wife sold his plans and machine to brothers named Redwine and they reportedly sold them to the Wright brothers. Sylvia Dyer Turnage was the organizer of this recognition of her great, great grandfather and thanked her family for all their support and help. 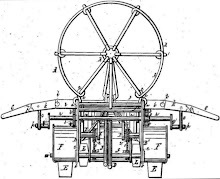 She said she first read about the flying machine in a family history book, but it was 25 years later when the 1874 patent for the flying machine was found through the internet. Turnage turned a poem she had written about this unusual man into a song, which she sang accompanied by Sam Ensley on the guitar. The highlight of the event was the unveiling of a road sign, one of three, dedicating part of 180 to Micajah Clark Dyer. This came about through efforts of Rep. Charles Jenkins in having the Georgia Legislature approve a proclamation honoring Dyer.